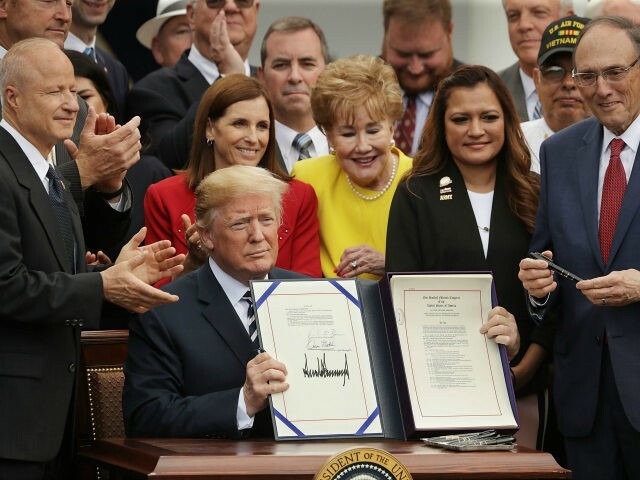 President Donald Trump signed the VA Mission Act on Wednesday, legislation allowing veterans waiting at government-run hospitals to get care from private health institutions. Trump noted that part of the reason he ran for president was to help improve veterans’ care. “As a candidate for president, I promise to make reforming the VA one of my absolute highest priorities, and from the first day of my administration, that is exactly what we have done,” Trump said at the signing ceremony in the Rose Garden. Trump also recognized the anniversary of D-Day during the event. He used the anniversary to remind Americans of the solemn duty they have to their veterans. Trump explained that the bill was the result of a long fight with political interests to finally deliver on veteran access to private care. “No one who defends our country in uniform should have to fight for their lives when they come back,” he said. The bill consolidates and streamlines several community care programs in Veterans Affairs and includes funding for modernizing the infrastructure used to handle veterans’ claims.